This is a pretty short book, and a quick read. I've been reading about the world in the Middle East, its history and religion, and stumbled across this book. 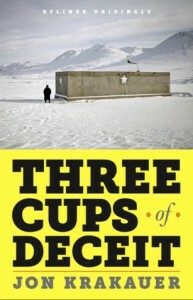 I have heard, of course, of Greg Mortenson who wrote "Three Cups of Tea". In Mortenson's book, he describes his experiences in Pakistan and Afghanistan that resulted in his desire to build schools in those areas. He created a charity called "Central Asia Institute" to carry out that altruistic plan to build schools for children.Krakauer wrote this book to expose the known lies and misinformation that Mortenson has perpetuated. Krakauer himself was a supporter of CAI and of the work Mortenson purported to be doing. However after finding more details out from CAI staff and directors who resigned, the author began his own work in tracking down what was true and what was not. Sadly, Mortenson himself turns out to be an autocratic dictator, accountable to no one, and with no clear work accomplished in central Asia.